Although lung cancer therapeutics have evolved dramatically within last two decades, lung cancer is considered the primary cause of cancer deaths globally. Non-small cell lung cancer (NSCLC) is responsible for the majority of lung cancer cases. New approaches in lung cancer therapy are vital in treating NSCLC patients. The NCI-H1975 epithelial cell line was isolated in 1988 from lung cells taken from a non-smoker female patient with adenocarcinoma. This cell line is a potent tool for performing preclinical tests for lung cancer treatment. A study by Smith et al. 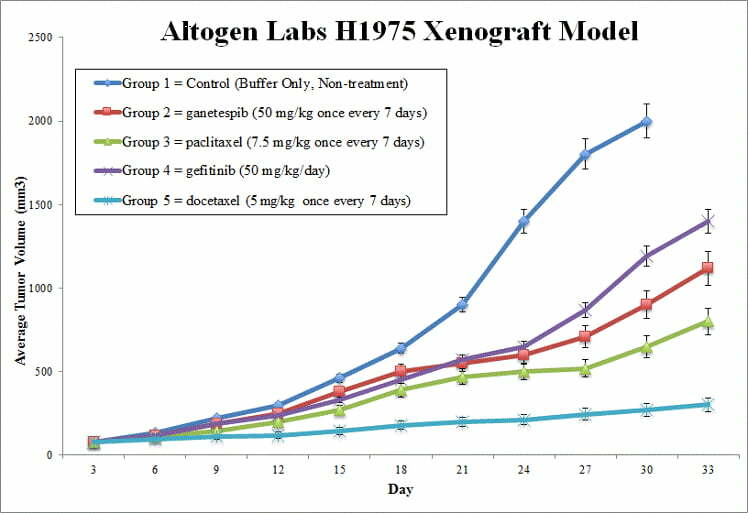 published in Targeted Oncology investigated the antitumor efficacy of selective EGFR tyrosine kinase inhibitors (TKIs) and the HSP90 inhibitor ganetespib, alone and in combination, using the NCI-H1975 xenograft model. The results indicate that concurrent administration of ganetespib overcomes erlotinib resistance and significantly improves tumor growth inhibition in erlotinib-resistant NCI-H1975 xenografts. According to the article, combination treatment with both drugs substantially enhances antitumor response and could be a therapy of choice for NSCLC patients. A 2018 Clinical Cancer Research study (Steiner et al.) used the NCI-H1975 xenograft model to study the effects of mutated epidermal growth factor receptor (EGFR) with treatment with cetuximab, a monoclonal IgG1 antibody also known as Erbitux. EGFR is mutated (somatic) in 10% of patients which affects EGFR targeted therapy; results demonstrated that cetuximab had antitumor activity with both wild type and mutated EGFR and that combination treatments with cisplatin or docetaxel increased these effects which is particularly relevant for chemorefractory NSCLC. In 2015 Cross et al. released a study in Cancer Discovery using the NCI-H1975 model to look at overcoming T790-mediated resistance to EGF receptor tyrosine kinase inhibitors (EGFR TKIs). They found that treatment with AZD9291, an irreversible dual inhibitor of EGFRm+ and T790M inhibits tumor cell growth and signaling pathways in advanced NSCLC. The H1975 cell line (human lung) is used to create the CDX (Cell Line Derived Xenograft) NCI-H1975 xenograft mouse model. The H1975 xenograft model is a mutated EGFR (T790M, L858R) expressing model used for preclinical studies of monotherapies or in combination (e.g. cetuximab, cisplatin, gemcitabine, docetaxel). Prior to trypsinization of H1975 cells, they are continually grown at a phase of exponential growth. Viable cell counts are determined using trypan blue and concentration is adjusted to appropriate density needed for injection. 12 week old athymic BALB/C mice receive subcutaneous injection into the hind leg. Each animal receives a 100 µL injection containing one million cells of the Matrigel + H1975 suspension. Tumors are calipered until growth reaches average sizes of 50-150 mm3. At this point, grouping of mice into treatment cohorts and injections of the compound of interest is started according to treatment schedule. Mouse body weights are documented up to 3 times weekly, with tumors calipered daily. When the end of study parameters are reached (i.e. maximum tumor size), animals are euthanized. All tissues collected snap frozen, submerged in a stabilizing solution (e.g. RNAlater) or nucleic acids isolated. Tumors are excised from the mice and weighed.